by Viviane Alchech Miner and Linda Krinn, Triad Publishing, 1984. Out of print. Trade paperback, 184 pages. 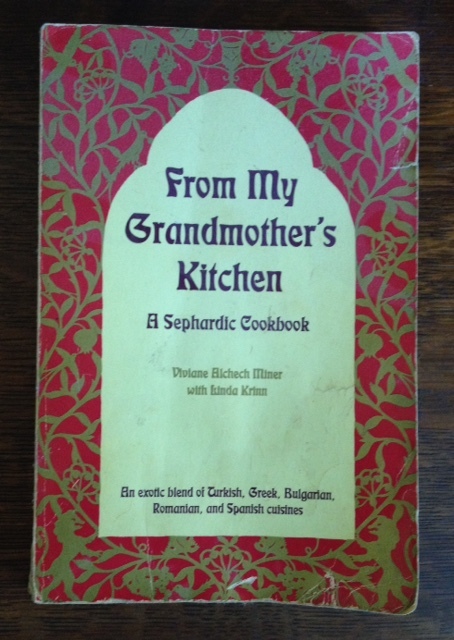 Turkish, Greek, Romanian, and Bulgarian Sephardic Jew cuisines, with an underlying Spanish influence. The dishes themselves are as fascinating as their names: cheese filled Bulemas, Pastel Berenjena (eggplant pie), Bourekitas Espinaca (spinach turnovers), Reyenados Stuffed Vegetables, Albondigas Vinaigra (Turkish Sour Meatballs), Bulgarian Filled Bread, Canella, Halvah, Baklava, Melon Cream and Anise Biscotchos." Monochrome photos throughout of the author as a child in Geneva, Switzerland, and of her relatives dating back back to 1905. Pages have yellowed and curled; wear to the covers and spine. Condition: Good. I really enjoy reading your newsletter!